This document has been created to outline the process of selection for the Team England programme during 2019. The squad, with the help of industry experts (Inc. elite coaches, physiotherapists, nutritionists & judges) will train, compete and develop together across a number of training camps leading to team selection for the 2019 ISA World Games (Location & date TBC). Automatic squad selection (where applicable) for those individuals who represented England at the 2018 ISA World Surfing Games in the Hyuga, Japan. Automatic squad selection (where applicable) for those individuals who represented England at the 2018 ESF Euro Juniors in the Santa Cruz, Portugal. U16 surfers who qualified for the 2019 World Grom Seach Finals. The U16 & U18 English boys and girls who finished with a top 2 (top 4 if a surfer has double qualified) placing at the English National Championships in 2017. The three highest ranked English surfers in the U16 & U18 boys (top 6 if a surfer/s has double qualified) divisions based on the standings at the end of the UK Pro Tour 2018. The three highest ranked English U16 & 18 girls (top 6 if a surfer has double qualified) divisions based on the standings at the end of the UK Pro Tour 2018. 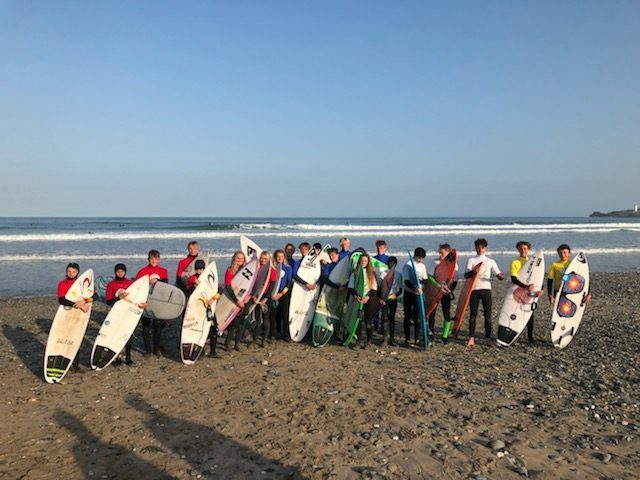 Injury Wildcard Selection, an injury wildcard/s will be handed out to any U16 & U18 male or female surfer who was selected in the previous seasons squad but missed over 50% of the training due to injury or illness. NB: The selection takes into consideration those surfers moving from one category to another.